“What the heck is aerial yoga?” The question came from George, one of my Airmen who had just found out that our first monthly, outside-of-work team activity was going to be a 90-minute session of hanging from the ceiling on a silk hammock while you transition through a series of modified yoga positions. After announcing it to my team, the seven Airmen were staring at us like we had just told them we were going to Mars for the day. Vulnerability doesn’t come after trust–it precedes it. Leaping into the unknown, when done alongside others, causes the solid ground of trust to materialize beneath our feet. Back when I first arrived at the unit in 2014, I knew we had a long way to go to creating a successful team. I was taking charge of a team whose charter was improving the processes, training, and operational tactics across our 500-person military organization. Over my first ninety days in the unit, I found the culture of the organization lacking cohesion, shared purpose, or joy. The Airmen were simply going through the motions and there was such a low energy to the organizational atmosphere. The worst part was the unit didn’t have any clearly defined vision or values. I wanted our team to take ownership and be the ones that catalyzed a movement toward ‘winning’ in both mission and culture. However, my first attempt at building out a shared vision and methodology to achieve this ‘Revolution’ completely fell flat. We had little to no organic idea-generation from the members of the unit. The brainstorming sessions I’d try to have were one-sided and ineffective. We were stuck in a linear-thinking pattern of: “how do we get more efficient?” I wanted us to get to: “how do we completely disrupt the way we do business?” If we were going to generate and experiment with our wildest ideas then we were going to need to trust each other. First, I needed them to trust me and follow me, if only out of curiosity! One of my favorite inspirational clips is this one, from Colin Powell. I love how quickly Powell identifies trust as the single most important characteristic of effective leadership: that a leader’s responsibility is to create conditions of trust in an organization. Powell tells the story of his drill sergeant back in Infantry Training telling him you know you are an effective leader when your troops are willing to follow you….if only out of curiosity. And that trust is built by shared experiences, caring deeply about their safety and success, and picking up their slack when they falter. I needed their trust so they would follow me, if only out of curiosity. We began dedicating 10-20% of our time building what we called our culture of innovation. On a monthly basis, each team member chose an activity that they hosted for the rest of the team. 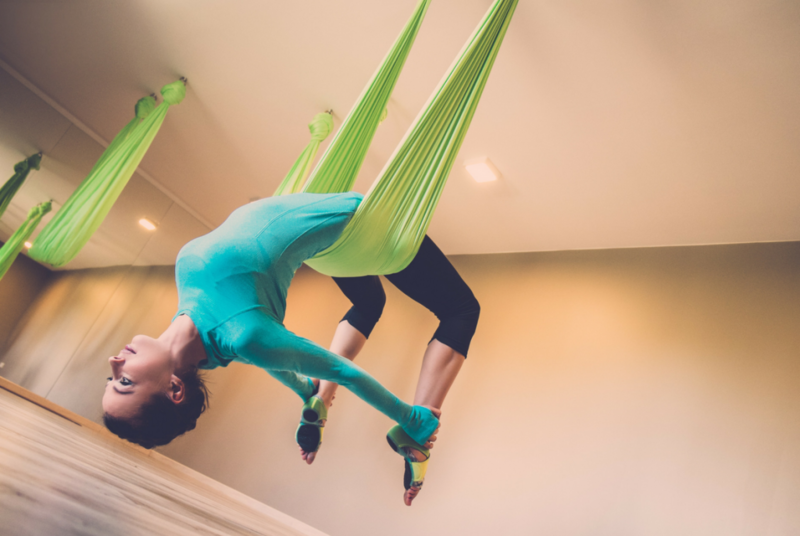 The first month: aerial yoga. The next month was golf, and then came rock climbing, trail running, Dungeons & Dragons, etc. Before, after, or during the activity, we would take time to discuss why the activity was special to the person? What feeling does the person get when they are doing the activity and what activities make the others feel that way? In these conversations, we would laugh and sometimes cry. Through shared experiences and showing our vulnerabilities, we built trust and psychological safety into our team’s DNA. Start every team huddle with some form of puzzle: I got to watch one of my favorite Airmen come out of her shell with this exercise! She shared how much she loved mind games and puzzles, and so I asked her to lead our team through one at the beginning of every meeting. This would be our warm-up and completely changed the energy, collaborative atmosphere in the room. This site that has some great prompts. Get beyond the office walls: in addition to the monthly activities such as aerial yoga, we would also try to have brainstorming sessions outside the office and outside of normal office hours. I later discovered the evolutionary reasons why we are more open-minded and creative in the evenings. Use improv to help build the vulnerability muscle: early on in our team development process, an Airman told me that what we were trying to do reminded him of Improv. He had been participating with the local Improv troupe for about a year, and he talked about how much trust and dynamic teaming it required! I asked him to lead us in a 2-hour Improv session every quarter. Check this article out for how businesses are using Improv to drive results. I started hearing “what if” a lot more in our team. I could feel the entire energy of the team change when we started cultivating our culture. They were optimistic, visionary, and dynamic. I challenged each member of the team to be a leader within the unit and perpetuate the culture that we were building. Eventually, our unit did completely disrupt the way our parent organization did business. We “10x’d” our mission output, brought in technologies that were decades away from being incorporated into our toolsets, and re-designed our department structure using a revolutionary model. Our unit was able to accomplish this through creating conditions of trust and psychological safety that unlocked ideas and coupled it with intrinsically motivated Airmen that were comfortable generating and testing wild ideas. Zayn Knaub is a True Believer who has found joy and purpose in leading transformational teams in elite organizations: Special Operations, US Air Force Weapons School, the Intelligence Community, and now Silicon Valley. Zayn is currently a Senior Success Manager at MuleSoft, a Salesforce Company, and has also been published in The Strategy Bridge. OMG friends - this may not look like much, but it’s a big deal to me! I’m sitting outside for the first time doing work in Omaha!! The locals agree that this winter has been the worst in a decade. Seeing the leaves starting to sprout and the grass turning green just brings a palpable sense of growth and renewal that I’ve been longing for.